Note: This is a google translated version of the original article. Use and updates of this article. Is allowed to use this article, either by copying or referencing it through a link, to anyone who wants it, provided only that you keep the author and a link to the original source of this article, and that is in my blog . Introduction As some of you know, I have some time to participate (with testing, suggestions, ideas, etc.) in the project of Tincore KeyMapper, and originally released for the console JXDS7300B. 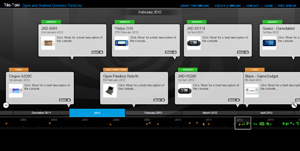 Tincore has not stood still, and has continued working on the project in order to offer its mapping tool on other devices and is not limited only to the console JXD, and there have been many users, both using other firmwares or devices, have asked for the possibility to run this tool and enjoy vengajas involved. I write this short article to introduce this tool, and above all, their availability in the of google [/url], and the possibility of installing on other devices. I hope to have some time to comment more extensively on the tool, and if there is time, generate some kind of online manual (or help create). It is worth noting that this tool has been developed and tested by users "gamers" (gamers) therefore has enough control and guidelines which are oriented to the use of game, and not a "generic" developed without taking into consideration users' preferences more "gamers", so it is much more interesting from this point of view, since it provides a tool that actually offers a real alternative support for games that do not have native support for controls, and has sought an effective way to enjoy them with physical controls. What is the use this tool? The first thing I should clarify is the aim of this tool, especially for those who are not familiar with either the console JXD or similar products. 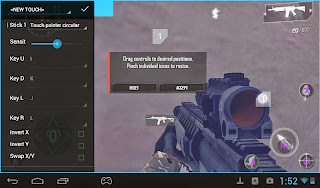 In android we have many ways to interact with programs and games. 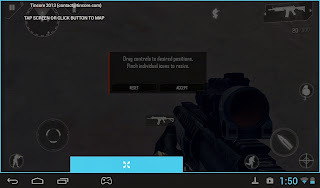 From those who have native support for joysticks, ie you connect a controller by bluetooth or USB port, and use the knob straight games, and there are other applications that have a full touch interface, and that in these cases are not you can use a command (for which there is no support, and therefore command has no effect on the application or game) Well, in these cases there are tools called Keymappers (or good, may have more names, but is one that we use it to understand), and basically what they do is assign a button or physical control (of a command, for example) , and set a screen where we simulate pressing. In principle, this is quite simple to understand, but in practice the alternatives fail to resolve completely or simply the "mapping" screen controls, being necessary to repeatedly perform the keymappers many existing configurations to achieve obtain the desired result. Well, with that in mind, Tincore has developed a tool that was initially simple to use and, above all, generate a standard solution to run on multiple devices and obtain a similar result in all of them. How to use the tool? The concept is quite simple for the user. When running the app will open an editor, where we will allocate physical controls screen areas. The interesting thing about the tool is that it is able to detect the controls we have available, as we are going to press, so there is no need for complicated settings in the program so that you know that we have controls. To be practical, we give an example. Suppose we have a android tablet, with USB OTG, and joystick support. With the game on the screen, open the KeyMapper Tincore editor. For this go to the Android notification area and select the list KeyMapper. Opens KeyMapper editor. It displays a panel with some special settings, but we will make the case for now. Now we clean interface. Let's assign the game buttons to physical buttons on the remote. We pressed a button on the remote. We will see that there is a button on the screen that will match you've pressed the button. Move button (with your finger) and position it where you want to generate the tap screen to press the buttons of the game. Then we press the control stick. We played in any part of the screen to bring up the settings panel. At the top you will see that there is a "check" and give. The program will ask for the name of the profile and, by default, we will put the name of the game (Android task). Give to accept without changing the name. The editor will close and we will be in game. Now if you move the stick see that the virtual stick (the game) also moves. If we see that the image of the game is very dark, you can use the alternative fund tool, allowing us to see more clearly the layout of the game's controls. Open the KeyMapper Tincore tool, and configure quickly identify on-screen controls. We then define a button (in this case, Start) to be Touch Swipe type, and use it to change weapons in the game. And we have defined our touch interface, the Archos Gamepad console and using the KeyMapper Tincore. Give the button to apply and save your configuration, and you can enjoy the game. Original tool Archos mapping Gamepad I performed a little experiment and I assigned the "A" with the Archos tool, and I have also assigned the same button Tincore tool. As you can see in the picture above, the button has been recognized and configured on both tools. 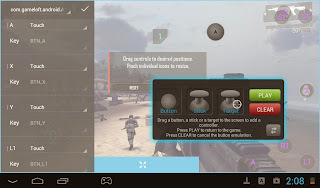 At the moment, there are not many games or applications that have support for more than one player and have the onscreen controls (ePSXe is an example, which splits the screen to Jugad 2 players on the same device, and the on-screen controls) , but since it's good to know that you can have a tool to distinguish between different devices and operate separately. 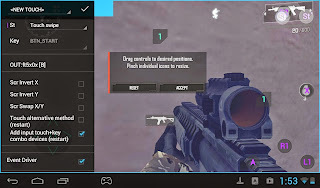 We can also set a keyboard and screen to map keys, or devices can map combined with the range of customizations you can do is very wide and varied. 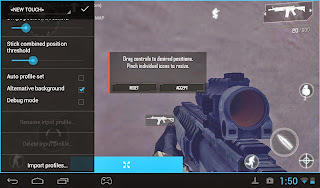 Differences between using the Driver Tincore or using Event mode Originally, this application was designed to work with the console JXDS7300B, and for such use generated a specific driver for the device controls. The current tool can run on devices that do not have a specific driver generated (this is one of its greatest strengths), but obviously there is some differentiation between the two versions. When you run the tool with native support of a driver (Tincore Driver), the input lag you get is minimal, almost nonexistent, and therefore more demanding user should be the optimum choice of using an Android console. On the other hand, the use of the Event mode, which is the mode if there is no specific driver for implementation and has more input lag characteristics that Driver mode, but the input lag will notice only the most demanding players or foodies , but it's a minimal input lag of any forms, and in many cases difficult to differentiate whether or not. 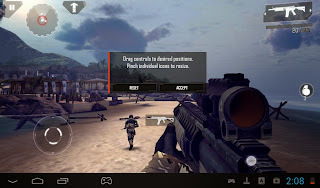 Final Words The tool is a very good starting point to support devices that do not have such tools to enjoy android games completely or, at least, more satisfying than the alternatives available today. There are many features new proposals, but they will be giving priority to the most important or urgent, of course. I encourage everyone to download the tool and try and talk about your experience, here or in the same google play. The address for downloading the tool is this: KeyMapper [/url] (google play) For suggestions, bugs or any comments, suggest post directly into the tool forum . Zalu2! Yes we've got a problem actually with the text. BTW, Thanks a lot for this great work ! question. do you have the original G18, right? can you press many buttons at the same time, without overlapping issues? i can see you have G16 too. Can test on this device too? Tincore is trying to get feedback here. Yes, I have the original G18 v2 (resistive + ICS), as I said, I will test on the evening. But sorry no G16 on my own, just trying to make rom cooking. Je l'ai testé aussi y'a quelques semaines avec mon frere, et ben ca envoie du lourd !! => tincore keymapper fait le lien entre une touche physique et l'écran virtuel. Le logiciel va donc simuler un appui sur l'écran lorsque que vous presserai une touche de votre Pad physique. => Lorsqu'un émulateur ne reconnait pas l'une de vos touches (exemple R ou L analogique ou joystik). => Vous pouvez aussi l'utiliser pour les jeux android qui ne reconnaissent pas votre manette. 1/ lancer tincore puis réduissez/minimiser le à l'aide du menu tincore. 2/ lancer ensuite le jeu ou l'émulateur souhaité (afficher et rendre actif le Pad virtuel sous émulateur). 3/ Dans la barre de notification android, relancer tincore. 4/ Appuyer plusieurs fois de suite sur la touche physique à mapper, elle apparaîtra ensuite à l'écran. 5/ Déplacer cette touche à l'aide d'une sourie ou de l'écran tactile vers la zone qui doit correspondre à la touche appuyée. Refaire la même action pour toutes les touches voulues. 7/ Sur émulateur, laisser le Pad virtuel actif mais caché le ou fois votre mappage terminé sur tincore. La prochaine fois que vous lancerai votre jeu, n'oublier pas de lancer votre profil tinecore enregistré. Il faut que le logiciel soit actif dans la barre de notification (tâche de fond). Note : sur émulateur, rien ne vous empêche de cumuler tinecore avec le mappage des touches physiques de l'émulateur. Ce que je fais souvent et que je map un maximum de touches via l'émulateur et n'utilise tincore que pour les joystik non reconnu ou les L et R analogique. Seem to have a lot of possibility. Merci pour le mini Tuto newrare. » HAYLEY16 , a gagner une carte google play !